This genus is accepted, and its native range is W. Tropical Africa. Annual (1), or perennial (2). Culms erect (1/1); 30-66.66-120 cm long. Ligule a fringe of hairs. Leaf-blade margins cartilaginous (1/1). Inflorescence a panicle. Panicle open. 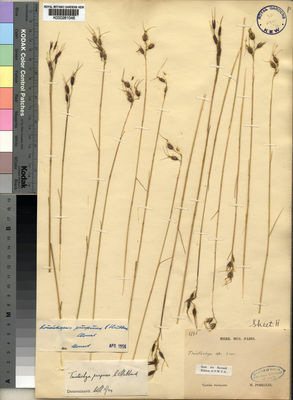 Spikelets in pairs (1), or in threes. Fertile spikelets pedicelled; 2 in the cluster (1), or 3 in the cluster; subequal. Pedicels filiform. Spikelets comprising 1 basal sterile florets; 1 fertile florets; without rhachilla extension. 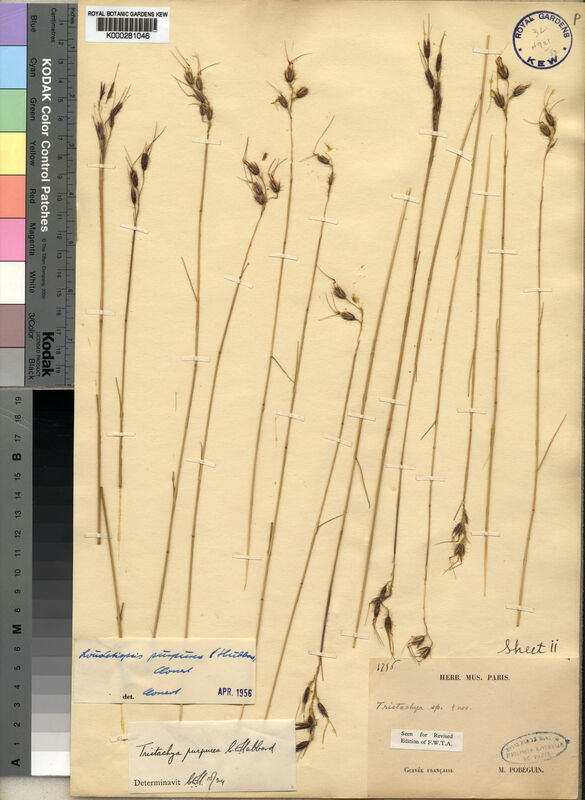 Spikelets lanceolate; laterally compressed; 4.15-7.358-12 mm long; falling entire (1), or breaking up at maturity (2); deciduous with the pedicel (1/1); disarticulating below each fertile floret (2/2). Floret callus evident (1), or elongated (2); pubescent (2), or pilose (1); truncate. Glumes persistent (2/2); reaching apex of florets; thinner than fertile lemma. Lower glume lanceolate; chartaceous; without keels; 3 -veined. Lower glume surface hispid (2), or setose (1). Lower glume apex acute. Upper glume lanceolate; chartaceous; without keels; 3 -veined. Upper glume surface puberulous (1), or hispid (2); with simple hairs (1), or tubercle-based hairs (2). Upper glume apex acute (1), or acuminate (2). Basal sterile florets male; with palea. Lemma of lower sterile floret lanceolate, or elliptic (1), or oblong (1); chartaceous; 3 -veined; acuminate. Fertile lemma lanceolate (1), or oblong (2); coriaceous; without keel; 5 -veined (2), or 6 -veined (1), or 7 -veined (2). Lemma surface pubescent; with a transverse row of hair tufts. Lemma margins involute; interlocking with palea keels. Lemma apex lobed; 2 -fid; incised 0.25 of lemma length; awned; 3 -awned. Principal lemma awn from a sinus; geniculate. Lateral lemma awns shorter than principal. Palea 2 -veined. Palea keels approximate (2), or contiguous above a sulcus (1); unthickened (2), or thickened (1); wingless (2), or winged (1). Anthers 3. Ovary glabrous (1/1). Caryopsis with adherent pericarp; obovoid (1/1). Hilum linear (1/1).